by Chris Woodford. Last updated: September 6, 2018. Scientists tell us the world is slowly warming, mostly because of the carbon-based, "fossil" fuels we're burning in power plants and vehicle engines. Good or bad, it's taken a couple of hundred years of industrial revolution to make the world what it is today and we can't switch from being energy-hungry to being clean-and-green overnight, no matter how serious global warming may seem. That's why many companies and some individuals are using carbon offsets in an attempt to make a difference. Instead of stopping their environmentally harmful behavior, they pay money toward green schemes that seek to compensate for the damage elsewhere—for example, by planting trees in developing countries or investing in wind-power projects at home. Carbon offsetting sounds great, but it's proved controversial for all kinds of reasons. Is it a good thing or a bad thing? Does it really make any difference to global warming? Let's take a closer look! 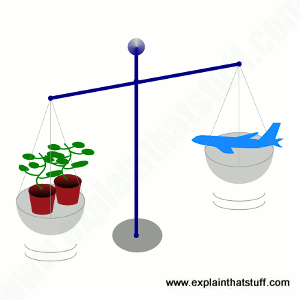 Artwork: The concept of carbon offsetting: can you balance the negative things you're doing to the climate (for example, by flying) by doing enough positive things to compensate (such as planting trees or investing in green energy)? Carbon offsetting means compensating for the carbon-dioxide pollution you're making (your carbon footprint) by preventing the same amount of pollution from happening somewhere else. More precisely, one carbon offset means compensating for emitting one tonne of carbon dioxide (CO2) into the atmosphere by preventing a tonne of CO2 from entering the atmosphere elsewhere on Earth (for example, by investing in renewable energy) or by removing a tonne of CO2 that's already up there (by supporting something like tree planting—since trees pull CO2 from the air when they grow). In theory, you could offset your carbon dioxide emissions (also called greenhouse emissions or greenhouse-gas emissions) by doing environmental good work yourself. For example, if you have to fly around the world on business, you could plant some trees on land you own, or you could offset more indirectly by making a donation to campaigning work with an environmental organization. But the whole point of carbon offsetting is to match exactly the "carbon damage" done in one place with "carbon repair" elsewhere, so you need to be sure you're getting a tonne of benefit for a tonne of harm. In practice, we outsource the repair part of the equation: carbon offsetting means making a payment to another company who will finance beneficial environmental work on your behalf. Photo: Investing in solar power (and other forms of renewable energy) is a popular way to "offset" carbon dioxide emissions produced by conventional sources of energy. Most environmental damage is done by governments and corporations, albeit on behalf of individuals; most carbon offsetting is done by governments and corporations too. Worldwide, companies spend many times as much on carbon offsets as individuals. Under the Kyoto Protocol (the main global piece of legislation charged with tackling climate change), governments are allowed to help one another to reduce their collective emissions through something called the Clean Development Mechanism (CDM). The basic idea is that industrialized nations pay developing nations (or help them in other ways) to make an overall reduction in global emissions on their behalf. What sorts of things does carbon offsetting pay for? There are literally dozens of different ways of reducing carbon dioxide emissions, from investing in energy efficiency and renewable energy to planting forests. Renewable energy projects are the most popular; forestry projects the most controversial. What are the advantages of carbon offsetting? In theory, carbon offsetting can make a difference in helping the world to tackle global warming, as long as the offsets are funding genuinely beneficial, long-lasting environmental projects that would not have happened anyway. Good offsets really can be a win-win. 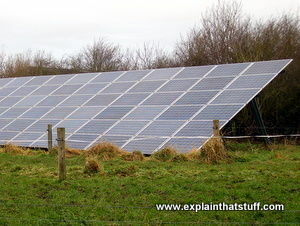 For example, if you offset by investing in a wind-energy project that would not otherwise have been financially viable, you're adding to the overall supply of renewable energy, reducing the amount of fossil fuels consumed in future, and helping to shift the world (albeit in a tiny way) onto a greener path. Not all offsetting projects take place in developing countries, but those that do often bring what are called "cobenefits." If your offsetting payment helps to plant trees in a strictly protected wildlife reserve in Africa, it will be creating new habitat for animals and helping to arrest declining biodiversity. It might provide employment to local people and it could bring in extra revenue from tourism that will help to lift people out of poverty. 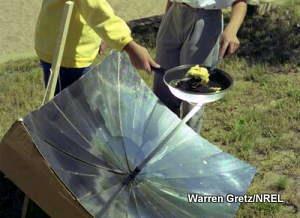 Some offsetting projects help people in developing countries by supplying "intermediate technology"—things like low-tech solar-powered cookers. These reduce the need for women and children to spend hours collecting wood-fuel (which means children can spend more time in school) and bring health benefits too (indoor air pollution from solid fuel is a major cause of respiratory illness and an estimated 4.3 million deaths per year, according to the World Health Organization, February 2016). Photo: Efficient solar cookers like this reduce wood-fuel burning and provide health benefits in developing countries. Photo by Warren Gretz courtesy of US DOE/NREL (US Department of Energy/National Renewable Energy Laboratory). What are the drawbacks of carbon offsetting? The main criticism leveled at carbon offsetting is that it avoids dealing with the real problem: the damage you're causing in the first place. Scientists who chart the problem of global warming tell us the solution lies in making deep cuts in rising greenhouse-gas emissions; paying up instead isn't solving the problem. It's like accepting you're doing wrong by driving too fast and repeatedly paying your ticket for speeding instead of changing your behavior and driving more slowly. As English environmental journalist George Monbiot puts it: "You buy yourself a clean conscience by paying someone else to undo the harm you are causing." Another problem is that the benefits of carbon offsetting may be hard to quantify: if you pay to plant trees, exactly how much carbon dioxide will they remove from the atmosphere during their lifetime? Enough to justify your long-haul flights? You have no way of knowing. If the projects you're funding would have happened anyway, without your help, you've provided no additional benefit to the planet—you've done the damage, without question, but your "offset" hasn't made up for it. Other problems with offsets include the fact that they're often voluntary (at least, for individuals) so they don't change collective behavior in the way that carbon taxes (taxes on polluting behavior) often can. Some offsetting projects have come in for much more criticism than others. Tree-planting (reforestation) projects, for example, are notoriously controversial. Trees take decades to grow, so it''ll be a long time in the future before they make any impact on the problems we are causing today—by which time it may be too late. And what impact will they make? While planting trees is generally a very good thing, the benefits are impossible to quantify (as carbon offsetting literally requires) and not necessarily permanent. There's no guarantee that trees grown as offsets won't be felled later, accidentally destroyed in a forest fire (releasing the carbon dioxide back into the atmosphere), or killed through poor management. In terms of biodiversity, monoculture, plantation trees are no substitute for old-growth, ancient forests, so it would wrong to assume you could offset activities like burning down a tropical forest for cattle ranching by planting vast numbers of new saplings. Plantations like this may displace local people or harm the environment in other ways, for example, by causing rivers to dry up. Ultimately, it doesn't matter how many trees we plant: we could never plant enough to arrest the damage we're doing by using fossil fuels—so that must change too. A further issue is that carbon offsets attempt to give a monetary value to environmental damage and repair, which is problematic when money has different value for different people. A millionaire and a poor person will cause exactly the same environmental damage if they share the same long-haul flight, but if they pay equal amounts of money to offset their emissions, the poor person may be contributing much more (say, a day's pay) than the rich one (a minute's pay, or whatever it might be). Now, theoretically, if both of them buy the same amount of offsetting and it makes up for their flight emissions, it doesn't matter: they've both made good. But, in reality, the poor person will feel that a long haul flight's emissions are equivalent to a day's pay, where the rich person equates the same emissions to a minute's pay. The rich person will have less incentive to keep on polluting in future, whereas the poor person might think twice. Photo: Forestry is a particularly controversial way of offsetting: today's carbon-offset reforestation project could be tomorrow's carbon-dioxide emissions. 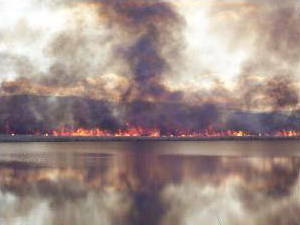 Photo courtesy of US Fish and Wildlife Service. Are carbon offsets good or bad? Some consider offsetting an unwelcome distraction from the real business of cutting emissions and charge companies who boast about offsetting with "dodgy accounting" and "greenwash." Individuals who gleefully offset are accused of denial and self-deception. George Monbiot, a noted critic of offsetting, pithily comments that "Buying and selling carbon offsets is like pushing the food around on your plate to create the impression that you have eaten it." Environmental groups generally agree that the most important thing is for people to reduce emissions first and only then consider offsetting emissions they cannot reduce as a very last resort. So you should try to reduce the number of flights you take (or take trains instead of planes and buses instead of cars if you can). If you absolutely have to fly from one place to another and have no choice about doing so, offsetting your flight might then be appropriate. But you should offset only through an approved offsetting scheme that meets what's called the CDM Gold Standard. These are the most rigorously certified offsets and the ones most likely to make a difference to the planet. Another option would be to "offset" by making changes in other aspects of your life. For example, suppose you had to take a long-haul flight to attend a wedding on the opposite side of the world but felt guilty about the harm your flight would do. You could "offset" by upgrading your gas boiler at home to a much more efficient model, by telecommuting two days a week instead of driving to work, by improving the energy-efficiency of your home with fluorescent lamps or better heat insulation, or by investing in solar panels or a ground-source heat pump. You can be sure such things make a genuine, long-term difference. But keep this one point in mind: reducing the damage we're all doing right now, in the present, is the only real way to tackle climate change. 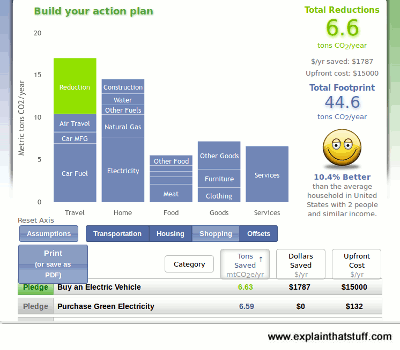 Screenshot: Think "reduction" before you think "offset": what can you do to reduce your environmental impact? How can you cut your emissions? Handy tools like the Cool Climate Calculator (from the University of California, Berkeley) allow you to calculate your carbon emissions and see how various lifestyle changes you make will reduce them. In this example, I've discovered that pledging to buy an electric car will reduce my emissions by about 10.4 percent. There are separate versions of the tool (with different emissions reducing ideas) for households and businesses. Environment: A list of our other environmental articles. Look at a selection of these articles and stories to get a proper, balanced view of the debate about carbon offsets. Pro: Carbon offsets deliver where it matters by Martin Wright, BBC News, 2007. This old but still relevant article argues that, despite their drawbacks, offsets can offer positive social and environmental benefits. Neutral/pro: What is a carbon offset? : A fairly balanced introduction to the pros and cons of offsetting from the David Suzuki Foundation, October 2017. Generally in favor of offsets provided they meet the gold-standard. Neutral/pro: Should You Buy Carbon Offsets? : by Brian Palmer, NRDC, April 2016. An argument in favor of careful and very selective offsetting. Neutral/pro: A complete guide to carbon offsetting: by Duncan Clark, The Guardian, 15 September 2011. A good summary of the pros and cons from The Guardian. Anti: Selling indulgences by George Monbiot. The Guardian, 18 October 2006. "The trade in carbon offsets is an excuse for business as usual". Opposed to offsets as a distraction from the more fundamental changes in behavior society needs to make. Anti: The inconvenient truth of carbon offsets by Kevin Anderson, Nature, April 2012. According to Anderson, a climate scientist at the Tyndall Centre, offsetting is based on fundamentally flawed logic and "... worse than doing nothing. It is without scientific legitimacy, is dangerously misleading and almost certainly contributes to a net increase in the absolute rate of global emissions growth." Flying Is Carbon markets back from the brink of collapse, says World Bank by Fiona Harvey. The Guardian, May 22, 2018. Considers the ups and downs of global carbon trading and its role in helping countries to offset their emissions. Flying Is Bad for the Planet. You Can Help Make It Better by Tatiana Schlossberg. The New York Times, July 27, 2017. A fairly basic, largely uncritical introduction. Make Forests Pay A Carbon Offset Market for Trees by Don J. Melnick, Mary C. Pearl, and James Warfield. The New York Times, 20 January 2015. Introducing the Rainforest Standard, an offset designed to protect tropical forests from logging. Forget carbon offsetting, insetting is the future: by Tim Smedley, The Guardian, January 2015. The new sustainability trend is for big companies to green their own supply chain as an alternative to offsetting. Peru hails Western carbon offsetting programmes by Dan Collins, BBC News, 28 March 2010. How carbon offsets have been used to help cocoa farmers plant trees in Peru. '30% of carbon offsets' spent on reducing emissions by Damian Kahya, BBC News, 7 December 2009. Most of the money spent on offsets disappears in tax, profit, and other fees, according to a report by Carbon Retirement. The Ins and Outs of Carbon Offsets by Melissa Checker, IEEE Spectrum, 12 June 2009. A good, balanced introduction to the pros and cons of offsets. Yahoo! Abandons Carbon Offsets in Favor of Efficiency: GreenBiz.com, June 2009. Carbon standard 'to renew trust': BBC News, June 2008. Carbon Footprint Reduction Instruments: An introduction to offsets and renewable energy certificates from the US Environmental Protection Agency. Carbon offsetting: Guidance from the UK government and details of its quality assurance scheme for approved carbon offsetting schemes. Carbon offsetting: The UK government's Department of Energy and Climate Change explains how carbon offsetting fits into the bigger picture of tackling emissions. National Carbon Offset Standard (NCOS): Introduced by the Australian Government in 2010. Overview of Carbon Offset Programs: Similarities and Differences: World Bank, 2015. Compares the key features of 11 international carbon offsetting schemes. Greenhouse Gas (GHG) Offsets: An introduction from the US Department of Energy's Green Power Network site, listing some of the main offsetting providers in the United States and a selection of third-party certification schemes.